Here’s a great resolution for 2010 – keep your sewing machine clean and happy! Here’s some advice from John Gass at Sandi’s Sewing Connection. He’s been cleaning and repairing machines for many years, and sees the same problems over and over – many of which can be avoided by keeping your machine clean and oiled. Check your owner’s manual for specific cleaning instructions for your machine. The tips below are useful for cleaning most sewing machines. WARNING: These photos may frighten your sewing machine! One very simple thing machine owners can do is keep the area under the stitch plate and around the bobbin clean. Lint and thread fragments tend to collect in these areas, causing a variety of stitching problems. Here, so much lint accumulated around the feed dogs that the stitch plate was actually raised and lowered when the machine was run. Generally just taking off the stitch plate will expose lots of lint – this is easily removed by gently brushing the lint out of the machine. 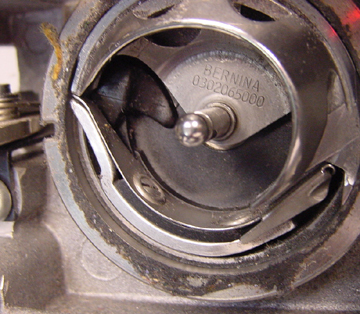 This picture shows lint in the hook race – the part that circles the bobbin case. Lint in this area tends to be oily, and gets packed into the hook race, especially in the narrow groove. To clean this area, remove the hook race (this can only be done on CB hook machines) and clean away the lint with a wooden toothpick. While you’re there, put a drop of sewing machine oil on the hook race to keep it running smoothly. A needle fragment jammed in the hook race can be removed by taking out the bobbin case and gently brushing the broken part out of the machine. Whenever a needle breaks, be sure to remove ALL of the pieces to ensure that they won’t get between moving parts and cause problems. 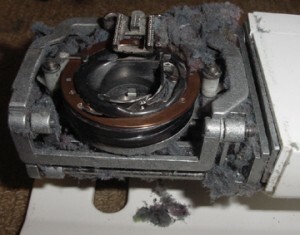 Lint and thread in the top tension discs can sometimes be removed by “flossing” the discs with a heavy thread – such as gimp or topstitching thread – dipped in rubbing alcohol. 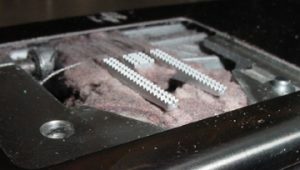 Lint can also collect in other parts of the machine that aren’t easily accessed. 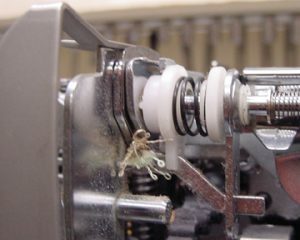 That’s why it’s important to have your machine cleaned regularly. Vacations are a great time to take your machine to the BERNINA technician for a yearly clean/oil/adjust – you won’t miss your machine if you aren’t at home! 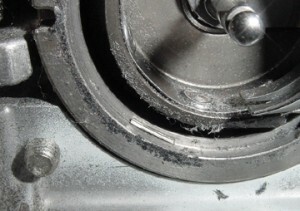 Broken threads can wind around machine parts and prevent parts from moving. 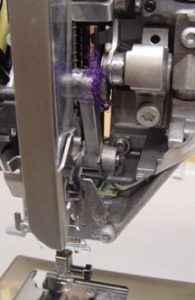 Thread wound around the needle linkage can cause the machine to bind and stop running. To help prevent this from happening, stop sewing immediately and remove the thread before it has a chance to begin wrapping around any parts. Once the machine is jammed, you’ll need to have a machine technician take your machine apart and remove the thread, then reset any parts that might have been pulled out of place. For more photos and machine maintenance tips, visit the Machine Service area of Sandi’s Sewing Connection website. Next Next post: Tips for a Smooth Move with Your BERNINA! Unbelievable! !Can not imagine someone doing that to their machine. If you take care of anything it will give you many years of service. Hi Vickie, sounds like you are getting frustrated with your machine! So sorry to hear that – I just sent you an email to try and get the problem solved.